This guide will show you how to get started with your punch needle project. Click on the photos to view them in more detail. Please also consult the FAQ section and the booklet that comes with your Oxford Punch Needle. 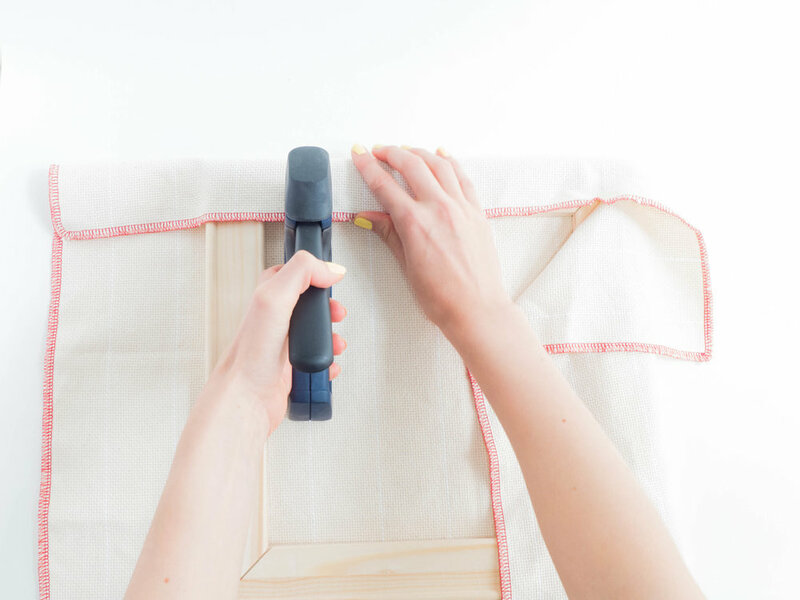 Staple the monks cloth to the wooden frame. It’s crucial that the fabric is stretched as tightly as possible on the frame. Draw on your design using chalk, a sharpie or similar pen. Thread your needle. See a photographic step by step guide of how to thread your punch needle in the FAQ. Thread your yarn through the hole of your needle, moving from the slotted to the other side of the needle. Pull on the short end that you just put through the hole until you have about an arm's length. Hold the needle in one hand and pull on the lower end (the one that comes out of the bottom of the needle). This will make the yarn pop into the slot. Just leave a tiny bit of yarn hang out of the needle's hole. You don't need to waste precious yarn here. For punch needles without a slit: use a wire or a long needle threader to pull the yarn through the needle. Make sure that the yarn’s end is coming out of the tip of the needle and thread it through the needle’s eye. Start punching. It's crucial that the slot of the needle points into the direction that you're punching. It's also important not to lift the needle up too high after a punch because this would pull out the loop. Just barely lift the needle and rather drag it over the fabric. Use the stitch gauge that came with your boxed punch needle to measure how big your stitches should be. If you make your stitches too big, there will be empty spaces on the loopy side of your artwork. Just give it a try. If you don't like what you're seeing, it's no problem to unravel and re-do. Whenever you start and finish with a thread, push the end towards the loopy side. Be careful to pinch your thread when lifting the needle to cut off the yearn so it doesn't pull out all the loops. You can use a closed scissors or some other tool to poke the thread to the other side. Cut off your ends at the same height as the loops. You can do this as you go or at the very end of your project. The beginnings and ends of your yarn threads will be identifiable because they will be slightly taller than your loops. Clean up your loopy side. Lines might not appear to be straight. In the photo to the left you can see how some dark blue loops are wandering off to the light blue side. This is normal! Just push and pull your loops to where they belong. Give yourself a round of applause for your finished piece.